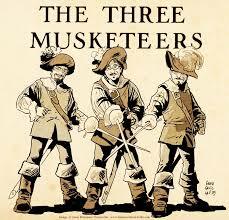 The Yoh Theater Players at Woodstock Union High School and Middle School will present The Three Musketeers on Friday, March 11 (7pm), Saturday, March 12 (7pm) and Sunday March 13 (2pm) at the Yoh Auditorium at the high school. This adaptation is based on the timeless swashbuckler story by Alexandre Dumas, a tale of heroism, treachery, close escapes and above all, honor. Come see Plymouth students Ian Dupont and Anna Hepler and a cast of twenty-five high school/middle school students. This entry was posted in Community News and tagged Plymouth students, Woodstock High School. Bookmark the permalink.